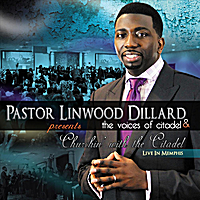 Anointed preacher, musician, ardent worshipper, and former minister of music, Linwood Dillard, is the founding Pastor of the Citadel Of Deliverance Church Of God In Christ in Memphis, TN. The Citadel, as it is affectionately called, is known as a place of deliverance that carries the Glory of God. The Worship Experiences are explosive, dynamic, and life-changing. Pastor Dillard, also the President of the International Youth Department of COGIC, has surrounded himself with amazing musicians and an awesome choir to capture an authentic move of God and offer music that will bless the music ministries of any local church. The CD is entitled, ‘Churchin With The Citadel,’ and yes, it is straight church. The project is versatile and includes various styles of gospel music. You will enjoy congregational singing, hymns, anthems, praise and worship, and choir selections that can be sang in any local church. The project features Reverend David Gillard, Reverend Darrell Petties, Psalmist Sharon Jackson, No matter the preference of music style, there is something on ‘Churchin With The Citadel’ that everyone will enjoy. DISCLAIMER: GET READY FOR THE GLORY! This release contains the hit single: 'NO WEAPON.' This anointed song is blazing and will ignite an exuberant, unrestrained praise as if it is Sunday Morning Church Time. Get Ready! You Will Shout! You Will Dance! You Will Leap!